Weekend Roundup: The Lake Effect! Skutt Catholic's "Vivace" from Nebraska won its first ever Grand Championship this weekend at West Liberty. LOS ANGELES, California  February is here! Love is in the air, some football thing happened over the weekend, and a couple of presidents are about to celebrate their birthdays. For the show choir community, however, February is when things really start to heat up. Over 100 different competitions will take take place this month coast to coast, hosting thousands of show choirs nationwide. Many groups now have a handful of performances under their belts, and as shows become more polished and refined, the competition grows tougher. It's sure to be an exciting month and we already have some amazing stories to share with you. Buckle up and hang on tight: your weekend roundup for the first week of February 2016 is here! We've mentioned them on an almost weekly basis in our recaps, but the lead story this week has to go to Hastings. They have not only taken Grand Champion honors at all four events they have competed at this year, but have also been awarded best vocals, best choreography, and best band at each as well. They've bested heavyweight groups like Wheaton Warrenville's "The Classics, " and ended the utterly insane 16-best-vocal-wins-in-a-row streak that Waukee's "Millennium" had racked up over a four year period. It's safe to say they are utterly dominating their season thus far. Their show's theme is "creation;" a fun period piece about innovation and self-discovery. 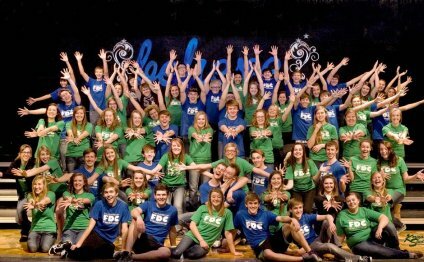 It's energetic, diverse, and everything that's great about show choir. Student Karissa Rother says, "For me, the most enjoyable part is all of the vocal tones we get to play around with throughout our show. It's a really entertaining set that's much different from years past!" They aren't slowing down any, either - in fact, they'll be going toe-to-toe with some of the best groups in the country at Wheaton's own competition later in March. For now, though, they are riding high on a very notable season and we salute their accomplishments. Another group who had a landmark performance this weekend was Skutt Catholic's "Vivace." The six-year-old choir from Nebraska was awarded their first ever Grand Championship win on Saturday at West Liberty's "Stars on Stage" event in Iowa (pictured, right). They were just one point behind first place in prelims, but used that as motivation to come back and win top honors in the evening round. They also took home best choreography, best band, best female soloist (Courtney Riedmann) and star performer (Amanda Polman). Director Chris Storm remarked, "[It was] a great day of singing, dancing, and sharing a message that can truly impact and inspire so many of our audience. Very proud of our students today." We congratulate Vivace on making school history! The group competes again next weekend at Elkhorn South. Still more records were set this weekend over in Ohio, where ETC community show choir "The All Americans" earned their first Grand Championship win under new director Bryan Detweiler. In fact, it was a career-first win for Bryan, who gushed, "I'm still shaking - dreams do come true!, " after the event. We know how much passion Bryan has for show choir and we send a huge and heartfelt congratulations to him and his choir for their achievement. ETC will compete again next weekend at Medina, where they will square off against groups like Solon and Findlay. It's fantastic to see such amazing talent, creativity, and diversity being celebrated all over the country, with both established show choir institutions and first-time winners alike being recognized. In our opinion, there really is no "loser" in show choir; just a bunch of really awesome people creating equally beautiful music.